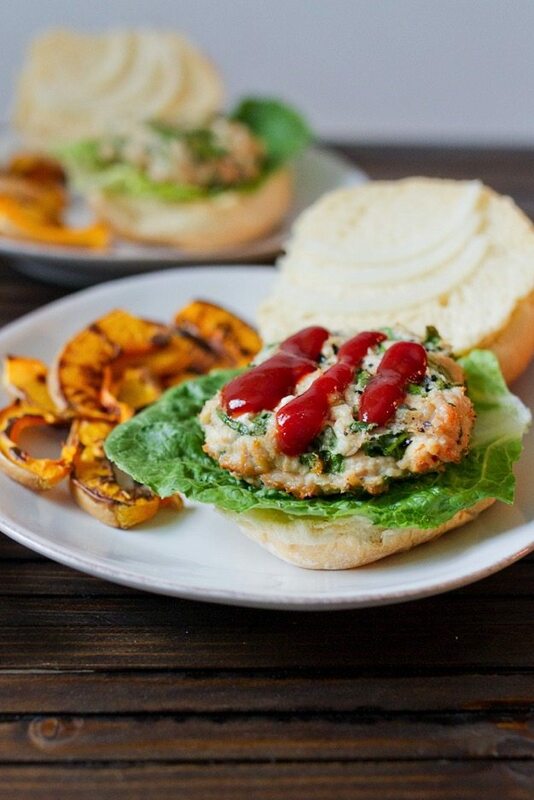 A healthy take on burger night, these spinach and feta turkey burgers are made with lean meat and loaded with flavor! 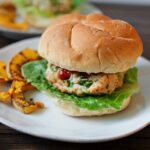 Last week in my WIAW post I mentioned that we had spinach and feta turkey burgers for dinner and a couple of you wanted to know where I got them or how to make them. Well, your wish is my command because I’m sharing the recipe today. After being Pescatarian for numerous years, cooking meat still feels very new to me so I have been doing a little experimenting lately (mainly with chicken and turkey). My first success was the Thai Curry Chicken recipe that I posted a while back. It’s just a simple seasoning but it’s so flavorful and tastes delicious. If you haven’t checked it out, definitely do so. It’s a household favorite. And then last week these turkey burgers were a hit so I feel like I’m slowly but surely learning the ins and outs of cooking with meat. 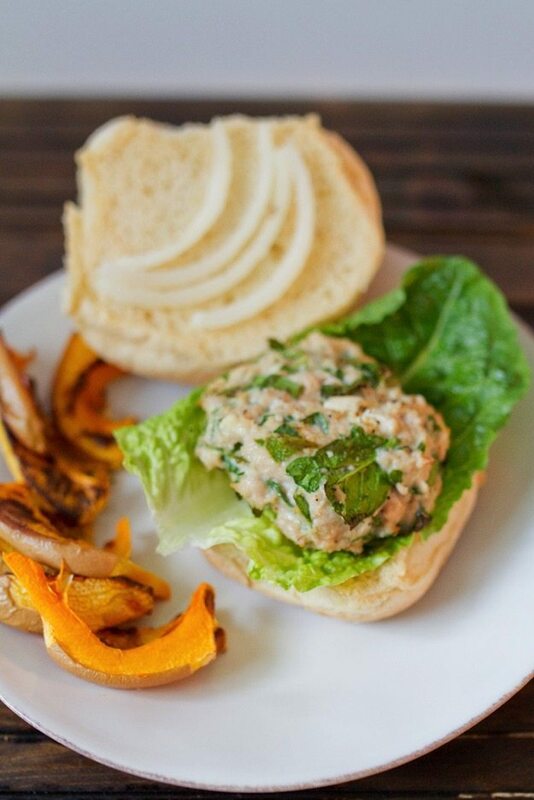 So these turkey burgers… they’re fast and ridiculously easy. All you have to do is mix up the ingredients, form the patties and toss them on the grill (or on the stovetop). Not sure if it’s grilling weather where you are yet, but we’re grilling fanatics so if it’s over 50° out, we’re firing up the grill! 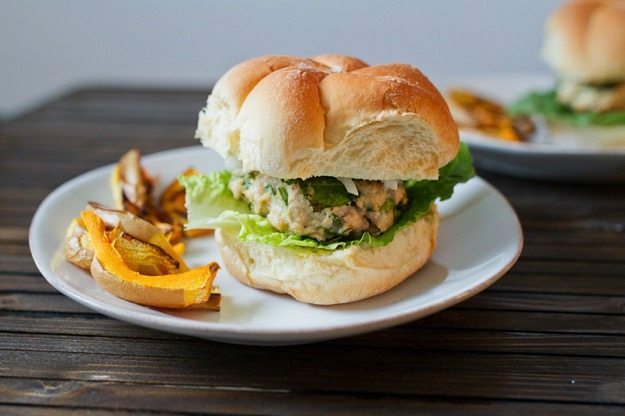 All you need is a handful of ingredients and you’ve got yourself a lean and tasty turkey burgers stuffed with spinach and feta. 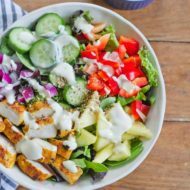 They have a hint of Mediterranean flavor which you can totally play up with the toppings — maybe a few olives and a spread of hummus? Sounds delightful to me. For this batch, we went the traditional route — lettuce, onion, ketchup and mustard. I would have added tomato slices as well, but we were out. Isaac had his burger on a big potato bun (seen in the photos) and I served mine over romaine lettuce — fork and knife style. If you’re gluten-free and want a bun, just be sure to find a gluten-free option and you’ll be good to go. Sometimes I’ll even use the gluten-free Food for Life english muffins instead of a bun. Oh, and the fries — those are baked butternut squash fries. They’re the best! 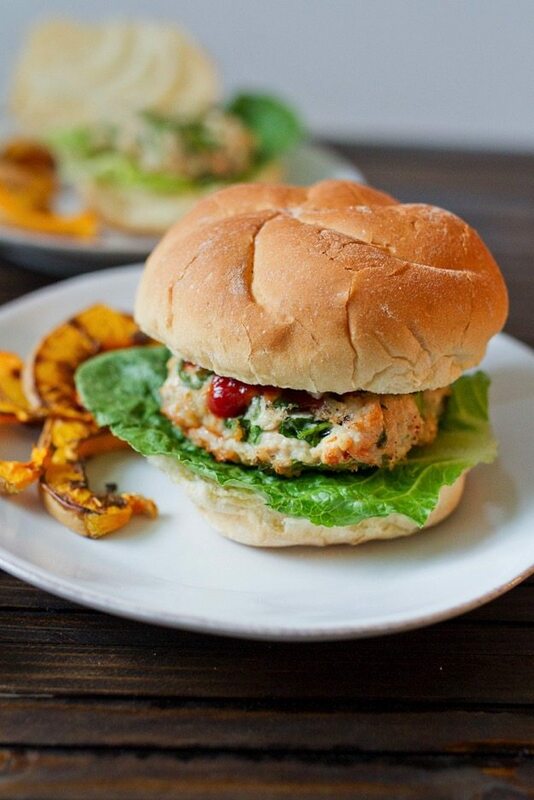 These spinach and feta turkey burgers are quick and easy to prepare and taste delicious grilled and served on a bun with your favorite burger toppings. Preheat grill to medium-high heat and lightly oil grill grate. While the grill is preheating, mix together turkey, spinach, feta, egg whites, parsley, garlic, sea salt and pepper in a large bowl until well combined. Using your hands, form mixture into 4-5 patties. Cook on preheated grill until no longer pink in the center, about 15 to 20 minutes. Serve immediately. This looks so yummy! I’m so ready for dinner! Yum! I’ve done turkey feta burgers, but haven’t added spinach yet. Great idea!! You can’t go wrong with spinach and feta. So glad it’s burger season! We eat turkey burgers all the time! 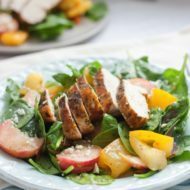 This is a nice, healthy recipe to try to add some flavor and variety to what we always eat. Yum.this is look healthy and tasty.We eat turkey burgers all the time. Love this recipe I tried last week it game out so good. Awesome. So glad you liked the burgers, Athena. I LOVE turkey burgers! They’re so flavorful. Spinach is a great addition here. 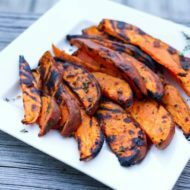 I don’t have a grill – could I just bake these? I think you could bake them, but I bet pan sautéing them would be even better! To bake them, what should be temp and time? Hey Lisa. I haven’t tried baking them, but I would think around 350°F or 375°F for about 30 minutes, flipping once around the 15 minute mark should work! Just be sure the internal temperature reaches 165°F.